Used Audi A2 Review - 2000-2005 | What Car? 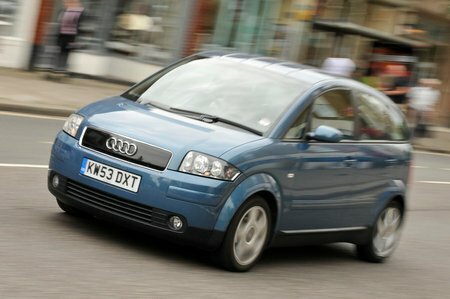 Which used Audi A2 hatchback should I buy? Two engines lasted the whole of the A2's life: a 1.4 petrol and a 1.4 TDi diesel. Both have 75bhp, which is plenty enough to haul the A2's lightweight aluminium construction around. The diesel's low-down pull and fuel economy of 64.2mpg is great. However, the petrol is almost as good to drive, and while the fuel economy of 46.3mpg is some way short of the diesel's, it's not to be sniffed at, especially when it's much cheaper to buy as a used car. Two other engines appeared at various stages, an 89bhp version of the diesel and a 1.6 petrol. Both had their talents, but there wasn't really any need for this more powerful diesel, and the 1.6 costs significantly more to insure. Rather than the basic or Sport trims, SE is the one you want, because you'll get climate control to add to its already generous standard kit.